Alexander Rodchenko and Varvara Stepanova in their studio 1922. 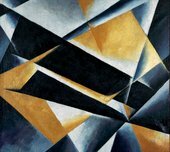 The great generation of women artists of the Russian avant-garde, including Natalia Goncharova, Olga Rozanova, Aleksandra Ekster, Varvara Stepanova and Liubov Popova, is by now relatively well known, as is its largely gender egalitarian, or at least gender neutral, abstract imagery. But we know much less about women artists of the 1930s under Stalin. Work from this decade is most often simply dismissed as socialist realism or propaganda art, yet many worked in modernist figurative styles, and saw themselves as every bit as revolutionary as the previous generation. Like their constructivist forebears Stepanova and Popova, they continued to produce exhilarating images of emancipated Soviet women well into the 1930s, until the state ideology of woman reverted to a more traditional, feminine and maternal model of limited equality. We find a similarly androgynous, emancipated female costume in the agitational performance Through Red and White Glasses (1924), designed by Stepanova. On the lower left of her poster for this event, under the phrase 'through red glasses' (i.e. 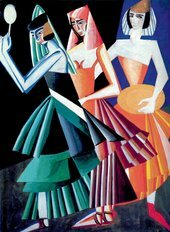 the world as seen by Bolsheviks), she drew three figures dressed in her prozodezhda costumes. The gender of the central, female figure is discernible only by the rounded line of her jaw and the slight fullness of her short hair. Their four anti-revolutionary white counterparts appear on the right side, dressed in upper-class clothes. Here the lone woman is strongly differentiated from the men, with round breasts, a tiny waist and wide hips. The female icon of those who see through red glasses is, again, a productive worker no longer confined by conventional signs of femininity. In 1939 another woman artist of the Russian revolution, albeit a far less famous one, also produced what was meant to be an iconic image of the equality of Soviet women: the poster Hail the equal woman of the USSR. Although Maria Bri-Bein had previously worked in a more angular, modernist style reminiscent of Popova and Stepanova, this poster depicts the woman in gently rounded forms, the belted pink sweater emphasising her bosom and hips. She demonstrates her equality by voting at the ballot box (in itself an arguable model of political action in the Soviet context), but otherwise – with her downcast head and bouquet of flowers – she represents a traditional model of demure and fecund femininity. She is closer in style to the anti-revolutionary 'white' feminine form of Stepanova’s poster. How did this profound shift come about? In the early 1920s, along with the Bolshevik campaign for the emancipation of women under socialism, the constructivist refusal of conventional notions of artistic genius – traditionally associated with masculinity – and its rejection of the hierarchy between fine and utilitarian arts – women were more often linked with the latter – facilitated the unusual, widespread participation of women artists in the young Soviet art world. 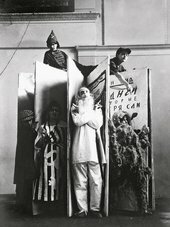 Popova and Stepanova, as we have seen, worked in costume and theatre design, but also designed mass-produced textiles, everyday clothing and propaganda posters, as well as producing mass-disseminated graphic works such as book and journal covers and advertisements. 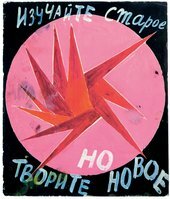 In 1923 Popova created her only propaganda poster based specifically on the theme of the emancipation of women – for the Bolsheviks’ so-called 'battle against prostitution'. 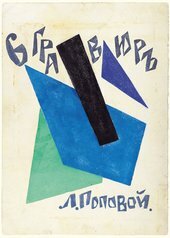 The slogan 'Brother Worker Protect Your Sister from Prostitution' is blocked into a symmetrical arrangement of dynamic constructivist horizontals, verticals and diagonals, and superimposed over hand-drawn figures (unusual in a constructivist work) of a large 'brother' in the centre and his proletarian 'sisters' in the upper right corner, working in a factory and looking out beseechingly at the viewer. The next generation of women artists of the early 1930s would build on the achievement of the Constructivists in poster design, albeit with two major differences. First, many of them worked in the medium not because of Constructivist ideals of erasing the hierarchy of fine art over utilitarian art, but because the increasingly conservative and centrally administrated Soviet art system made the prestigious field of oil painting less accessible to women, who were always last in line for scarce studio space and supplies. Secondly, they concentrated on 'women’s' themes not only out of commitment to the subject, but because they were often the only ones assigned to them within a still largely sexist institutional structure, in which male artists were given the 'universal' poster topics. Valentina Kulagina, who had success in the early 1930s, is a transitional figure between the avant-garde women artists of the 1920s and their figurative counterparts of the 1930s. 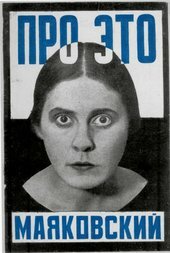 She had studied under the Constructivists in the 1920s and was married to the Constructivist Gustav Klucis, and she worked in poster design out of a continuing Constructivist commitment to the mass-dissemination of art – but also because she realised that the system would not support her if she attempted to practise in the fine arts. Her poster International working women’s day is the fighting day of the proletariat (1931) combines the Constructivist photomontage technique used exclusively by Klucis in his posters, on the right, with a monumental drawn figure of a fearless woman whose face appears hewn out of stone, on the left. Photographs of Soviet women in military uniform driving a tractor, working in a factory and laughing together float above a photo of a sexualised 'flapper' flanked by two policemen, evoking the decadent bourgeois femininity and sexual violence of the West. As Kulagina’s diaries show, Klucis criticised her for using hand-drawn images in her work, because it departed from the avant-garde orthodoxy against any kind of figuration that was not photographic. Yet many modernist-inspired female artists of the early 1930s experimented with novel forms of figuration, attempting to develop a new kind of modern and realist art to convey the socialist ideal of a strong, equal woman no longer subject to the inequities and objectification faced by those in the capitalist West. 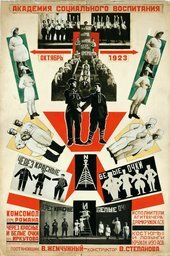 Kulagina’s 1932 photomontage poster Female shock workers of the factories and state farms, enter into the ranks of the Bolshevik Party demonstrates the ease with which she moved back and forth between photomontage and figurative drawing in her work. For her, there was no absolute line of difference; she chose the imagery that would best convey her assigned theme. Here she places a giant picture of a kerchiefed peasant woman with upraised hand, presumably exhorting other female workers and farmers to join her as a Party member, on top of photos of smoking factories, tractors plowing fields andwomen marching. She was responding to the tricky assignment of presenting a positive image of the female collective farmer at precisely the most brutal moment of the Soviet government’s forced collectivisation of peasants. Because peasant women were particularly resistant to collectivisation, which destroyed centuries-old arrangements of domestic and religious life, the Bolsheviks made them the focus of their propaganda campaigns. Unusually for this kind of propaganda, Kulagina chose a photograph of a woman who was not attractive for her central image. We know that she wanted to stress the seriousness of new Soviet women and their accomplishments, as a counterweight to their objectification, which persisted in the USSR in spite of the rhetoric of equality. In a diary entry of 1934, she complains that when she asked Klucis why he had chosen to foreground a photograph of a particularly pretty woman pilot in his aviation poster Young people to the airplanes (1934), he replied that he wanted to show that the pilot had 'retained her femininity' in spite of her training and qualification. Kulagina writes: 'And I’m thinking – but is that the purpose of the poster?' Of course it was not supposed to be the purpose of the poster, according to the ideals of women’s emancipation of the 1920s, and as illustrated in Constructivist and other images of strong women not bound by the traditional visual language of femininity. A number of women poster artists of the early 1930s clearly sided with Kulagina when it came to making images of women. The accomplished figurative painter Ekaterina Zernova, who had been a member of the avant-garde painting group OSt (Society of Easel Painters) in the later 1920s, was one of the very few women who would achieve success as a painter within the Soviet art system of the 1930s. 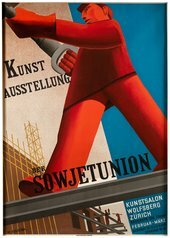 Her 1931 poster The participation of women in socialist construction offers an iconic image of the woman as a worker, rather than an object of visual pleasure: her face is schematically rendered and of medium attractiveness, while her body is encased in a jumpsuit that obliterates its contours. She is superimposed over smaller drawn images of the collectivised facilities of everyday life, mentioned in the poster’s long slogan, that will support her participation in productive labour: day care centres, nursery schools, public dining rooms and public laundry facilities. 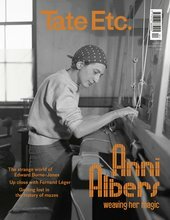 Zernova’s assignment would have been to produce an image fitting the slogan, so it was her choice to focus on the androgynous, uniformed and purposeful worker, rather than on the examples of everyday life (byt). Byt was considered a feminine sphere, and was therefore a less prestigious topic most often relegated to women poster artists. Zernova usually managed to avoid this kind of typecasting; she produced many works on industrial and military themes, and was particularly known for her intensely focused paintings and drawings of tanks. 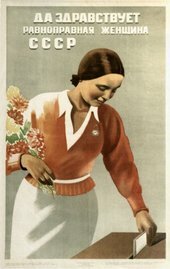 Maria Bri-Bein was assigned almost exclusively women’s topics for her posters, but she similarly avoided the stereotypically feminine themes of everyday life, producing instead, in the early 1930s, a striking body of images of steely, uniformed women capably performing various challenging tasks. 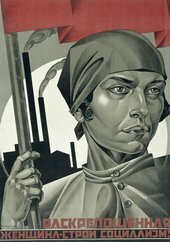 Her 1934 poster Woman worker and woman collective farm worker, master the technology of the sanitary defense of the USSR! Strengthen sanitary aviation! presents a dashing female pilot in black leather and goggles, consulting with an equally square-jawed colleague as they prepare for a long-distance medical flight. Behind them, a group of women collective farmers and workers (one easily identifiable by her jumpsuit and wrench, as in the Zernova poster) is being instructed on the intricacies of the plane’s technology by a uniformed woman with an arm badge. Not only Bri-Bein’s feminist subject matter (fantastical as it no doubt was), but also her schematic, flattened visual language, have strong affinities with Kulagina and Zernova – even though she was a member of AKhR, a more conservative artistic group that favoured traditional realism. Even in her paintings, such as Female Telegraph Operators (1933), we see some of the modernist tendencies of her posters – the geometric blocking of space and almost purist depiction of technological gadgetry, as well as the loving attention to buttons, collars and straps on uniforms and the motif of women working together intimately. In fact, the gorgeously over-the-top butchness of the women in the aviation poster make them ripe for reclamation today as lesbian icons, whether or not that was part of Bri-Bein’s original intention. The era of strong, skilled and unfeminine women in Soviet imagery began to draw to a close, however, in the mid-1930s. 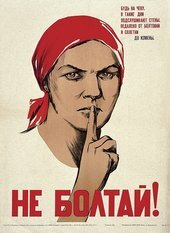 Stalin declared in 1935 that socialism had been achieved, and Soviet rhetoric shifted from the frenzied concentration on building up industrial production – including the participation of women in that process – to a new emphasis on an everyday life of cultured socialist consumption (kul’turnost), in which women would return to a more traditionally feminine role and appearance. They would be good mothers and wives, and they would be attractive. As the official Soviet women’s magazine Rabotnitsa (Woman Worker) put it in a 1937 article: 'The Soviet woman… must learn to preserve her feminine countenance and to look after herself… she should pay attention to her appearance.' That same year, Zernova painted her large canvas Collective Farm Workers Greeting the Tank, in which the women – the younger one in a tight, fashionable skirt and sporting a big barrette in her hair – hold out bouquets of flowers to the approaching vehicle, while the men raise their hands in authoritative waves, much like the woman worker in her earlier poster. Even her favourite motif of the tank is all but obscured by the relentlessly fecund flowering trees and the Impressionist brushstrokes. And I have already mentioned Bri-Bein’s 1939 poster Long live the equal woman of the USSR, in which the solitary woman passively casting her vote for the Party line, again carrying a bouquet of flowers, replaces Bri-Bein’s earlier images of female camaraderie in skilled labour. 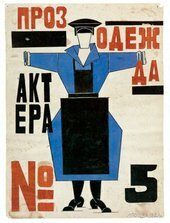 The sad contrast between the docile womanliness of this figure and the bold, angular women of the aviation poster, bristling with authority in their caps and goggles and straps and buttons, signals the definitive demise of the artistic ideals and new iconic images of the women artists of the Russian revolution.